This ❤ Google Interactive Activity ❤ is an engaging practice of Identifying Rational Roots of Polynomial Functions using the Rational Root Theorem. This is a BLENDED Activity where a hard copy(which is sold separately at my store here) of the activity is also included. 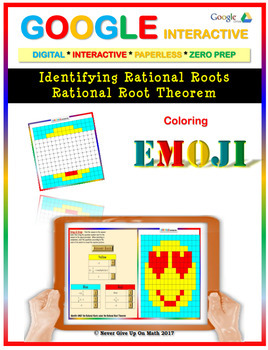 ✐ This product is a NO PREP - SELF CHECKING activity that engage students in 8 questions on "Finding the Rational Roots of Polynomial Functions. 1. In listing the possible rational roots. In the Google Interactive portion of the activity students will be using Google Slides. Some students used their computers, some used their phones, while others used their IPADs. As long as there is a Google Drive there is a way. I use Algebra II Common Core Pearson Textbook. 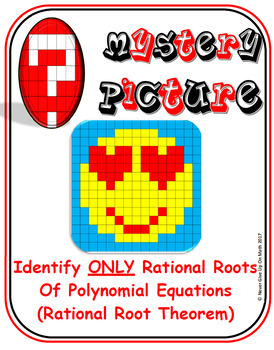 This activity works very well with Section 5.5: Theorems About Roots of Polynomial Equations.